Mary (called Polly) Stevenson, the daughter of Franklin's London landlady, became in some ways a substitute for his own daughter, Sally. 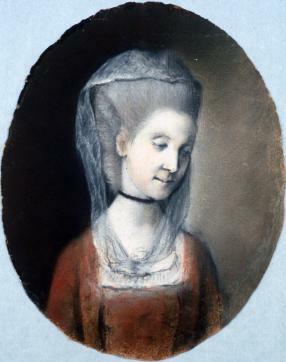 This may be a wedding portrait, since Polly was married in 1770 to a brilliant physician, William Hewson. Their marriage ended in 1774 with his death from blood poisoning, contracted when he dissected an infected corpse during his experiments.